Beauty is crossing borders and eras with this Mongolian traditional embroidery reinventing Art Deco. 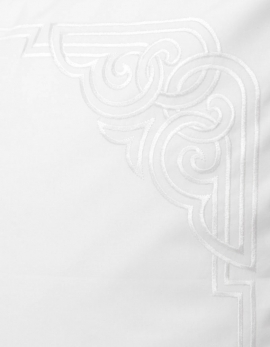 Curves and geometric lines in shiny white are tracing the map of elegance on a satteen of cotton of superior quality. Square pillow case in sateen of cotton (380 theads er square inch), color white, embroidered with shiny white thread. The embroidery is adorning the whole border of the pillow case. French fabrication. Rectangular pillow case in sateen of cotton (380 theads er square inch), color rwhite, embroidered with shiny white thread. The embroidery is adorning the whole border of the pillow case. French fabrication. 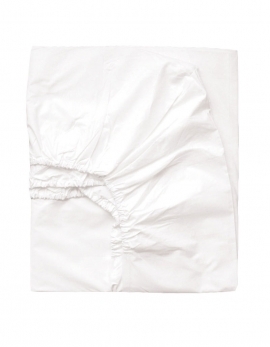 Fitted sheet in sateen of cotton (380 theads er square inch), white color. French fabrication. 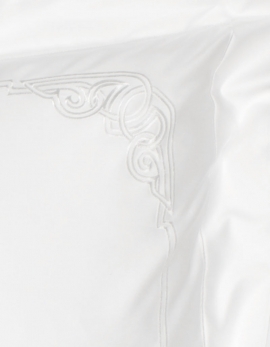 White satin top sheet embroidered with shiny white thread. 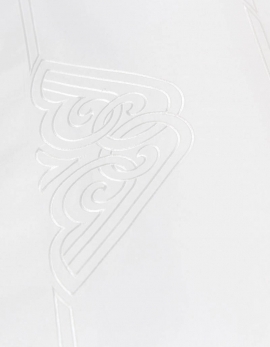 The top sheet is embroidered on the top folded part of the sheet. Made in France.